Private and public exogenous expenditures have different impacts on the sectoral balances. The same rate of growth in income has varying implications for the domestic private sector’s financial balance (saving minus investment or, equivalently, disposable income minus private spending) depending on the composition of the demand driving that growth. An increase in private investment pushes the private sector toward deficit. Even though the investment boosts income, saving will not rise as much as investment because of leakage to taxes and imports. In contrast, government spending adds income and saving for a given level of investment. An implication is that growth driven by private expenditure that occurs without compensating growth in government spending pushes the private sector into deficit except to the extent that net exports counter the effect. A growth regime reliant on private sector deficits is likely to come unstuck sooner or later. It implies depletion of net financial wealth and a likelihood of growing private indebtedness. Since households and firms, unlike a currency-issuing government, are financially constrained, this process has financial limits. Recent history culminating in the global financial crisis reflects this. Eventually, households and firms are compelled by circumstances to restore balance sheets to more normal levels. For growth to be sustained without exacerbating the tendencies to financial fragility already inherent in the present economic system, demand, and government spending in particular, would have to grow in a way that is compatible with ongoing domestic private sector surpluses. Needless to say, government spending growth of this nature is not the only condition for financial stability under capitalism. Notably, far-ranging financial reform and tight regulatory oversight are imperative if there is to be any hope of somewhat stable capitalist growth. Distribution also matters. Widening income inequality alongside regulatory neglect can push low-income households into private debt while reducing their capacity to repay. Although the present focus is on the role of government expenditure, this is not to downplay other requirements of a stable growth regime. Nor is it to defend capitalism. It could be argued that what follows underscores the unlikelihood of stable growth in the present system given the powerful political opposition currently standing in the way of sound macroeconomic policy. The sectoral implications of growth can be considered in terms of the income-expenditure model or the closely related sectoral financial balances model (see here, here and here for an introduction to these models). Government spending G0, private investment I0 and exports X0 are considered exogenous with respect to the circular flow of income. 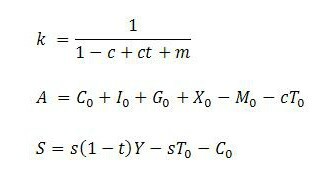 Consumption C, taxes T, saving S and imports M are assumed to be linear functions of income Y. They have autonomous components (C0, T0, -sT0 – C0, M0) and induced components that relate to income through the marginal propensities to consume, tax, save and import (c, t, s = 1 – c, m). Income is determined as the sum of total demand, exogenous and endogenous, and can be expressed as a multiple k of total net autonomous expenditure A. The last of these expressions is the saving function. It is useful when considering the impact of growth on the domestic private sector balance (S – I). If all components of net autonomous expenditure (A) grew at the same rate, the sectoral balances would each remain in stable proportion to income. For instance, if the domestic private sector and foreigners both were maintaining surpluses equal to 1% of GDP and the government, by accounting identity, was running a deficit of 2% of GDP, uniform growth of all components of A would reproduce these ratios over time. In reality, of course, the various components of A grow at different rates and the sectoral balances move around in relation to income. The diagram below illustrates the ramifications for the private-domestic balance (PDB) as well as government balance (GB) and foreign balance (expressed as foreign surplus) (FB) if government spending fails to keep pace with other demand components. For simplicity, all components of A other than government spending are assumed to grow by 3% per annum. Government spending, in contrast, grows annually only at the rate of 1%. 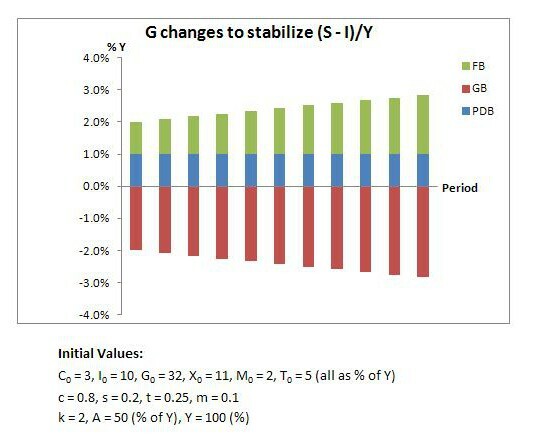 The diagram shows the private-domestic balance move from surplus into deficit over time as a result of the slower growth of government spending. Unless this move into deficit is consistent with private-sector intentions, the growth process is unlikely to continue for as long as the period considered in the example. Households and businesses will respond to an unintended deterioration of their financial balances by winding back the growth of their own expenditures. But even if an outcome of this kind is intended, as it may have been in the lead up to the recent crisis, such growth will engender financial fragility. In the illustration, the sluggishness of government spending prevents income from growing fast enough for saving to keep pace with private expenditures. 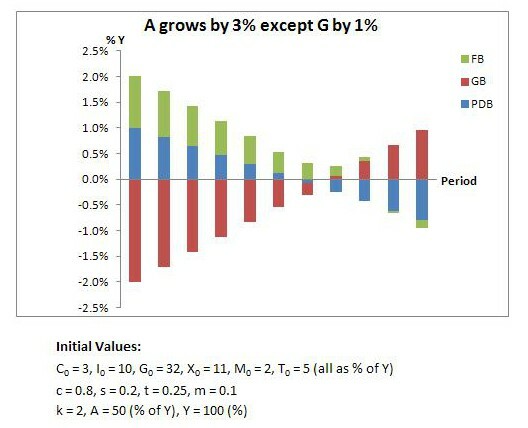 The impact on the growth trajectory is illustrated below for different rates of change in government spending. That is, for the domestic private sector surplus to remain in stable proportion to income, its rate of growth (left-hand side) would need to equal the rate of economic growth (right-hand side). 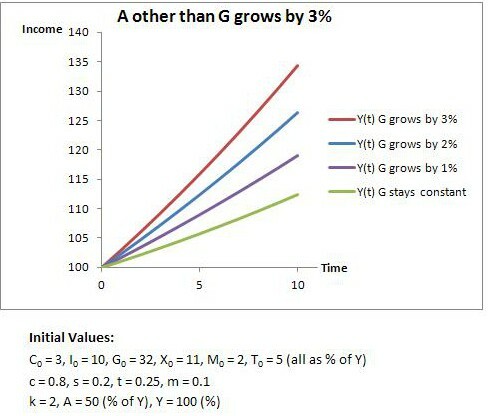 Here, the symbol ‘Δ’ denotes the change in a variable, and the rate of growth in a variable is the change in it divided by its value before the change. The fraction on the left-hand side is the rate of change of total net autonomous expenditure, which of course includes the autonomous expenditure of all sectors. The fraction on the right-hand side is specifically the rate of change of private-domestic net autonomous expenditure. Expression (2) indicates that the domestic private sector balance remains in constant proportion to income when net autonomous demand as a whole grows at the same rate as private-domestic net autonomous spending. The reason this circumstance satisfies the condition is that it means the economy as a whole (represented by the level of income) will be growing at the same rate as private-domestic net expenditure. And this, in turn, means that the endogenous leakage to saving will also grow at this rate in accordance with the marginal propensities to save and tax. Clearly, it is possible for different rates of (net autonomous) spending growth to occur across the sectors without violating condition (2) or, equivalently, (1). But it would require that the effects of any deviations of government and foreign sector growth from what was occurring in the domestic private sector just so happened to cancel themselves out. This can be made explicit by substituting for A and ΔA in (2). To prevent the expressions from getting too unwieldy, it will be convenient to group the elements of A into private-domestic (Ap), government (Ag) and foreign (Af) components. Expression (3) confirms that the combined rate of growth of Ag and Af would need to match the rate of growth of Ap for the private-domestic surplus to remain stable as a proportion of income. When foreign spending grows more slowly than private-domestic spending, government spending would have to grow more rapidly. Relative sectoral size matters, too. If the external sector is relatively small, its contribution to the domestic economy’s growth is also small and the growth rate of Ag would not have to rise all that far above the growth rate of Ap to satisfy the condition. There is no suggestion that government could keep condition (4), or equivalently (1), satisfied all the time. In principle, the levels of the autonomous variables in the most recent period can be roughly known. But changes in the various autonomous variables taking place in the current period can only be forecast. Having said that, the focus here is on the medium to long term, as opposed to short-term fine tuning. The suggestion is that over an extended growth phase, a fairly stable growth rate in government spending that was in sensible relation to the trend growth in other components of A would be conducive to financially sustainable growth, as far as this is possible under capitalist conditions. In the illustration used earlier, government spending grew too slowly to prevent a descent of the domestic private sector into deficit. Suppose now that, starting from the same initial values but introducing different sectoral rates of growth, government spending happened to change in accordance with (4). In the diagram below, it is assumed that the private-domestic component of net autonomous expenditure grows at an annual rate of 3%, as do autonomous taxes, whereas the external component grows only at the rate of 2%. If government spending happened to obey (4), it would grow at a rate of roughly 3.3%. This growth rate of government spending would cause the domestic private sector’s surplus to remain stable as a percentage of income. It would also mean that the economy’s growth rate matched the rate of spending growth in the domestic private sector. There is a gradual widening of the government deficit and foreign surplus that is sufficient to stabilize the private-domestic surplus at 1% of income. Policymakers might, in this scenario, reflect on whether the lower trend growth of the external component of A is a cause for concern or, considering imports are real benefits and exports real costs, a positive development. It might simply be a reflection of a desire among foreigners to save in a domestic currency that is attractive due to fairly strong macroeconomic outcomes. Alternatively, it might be expected that the trend will reverse itself before becoming problematic. Under different circumstances, the conclusion might be more negative. Structural features of the domestic economy might be limiting growth in exports or the development of import-competing industries, calling perhaps for an industry policy. Inequalities in income and wealth might be contributing to an ongoing tendency to net import if the demand for foreign consumption goods is coming mainly from a wealthier cohort. In some low-income countries, difficulties in obtaining access to key imported raw materials and capital equipment might make running an ongoing trade deficit problematic. Governments of such countries can always purchase what is available for sale in their own currencies, but external factors might require measures to secure access to key imports. In the particular example considered here, movements in the balances are mild and slow moving. There would be time to address any perceived weakness of the export sector through structural measures. Peter – nobody else has commented on the above. I don’t mean to be a nuisance, but could I throw very gently into the pond (as say a catalyst in the above schema) the consideration of the ‘I’ that underlies everything (am thinking of Neil Wilson here if you are interested): – Bunge – Ten Modes of Individualism. And restate from my pov – the Self in man is not the ‘I’ and that Self contains within it all of the truly formative and creative energies; the ‘I’ has the privilege of interpreting them (making things up). ”Life is a journey that is homeward bound …” [?] My point is as always, that back and behind of the dance of the ‘I’s in this world, evolution is still happening. But in dealing practically with the world as it is, there is both an inner and an outer path. That is the only solution that will be efficient and effective long term since individual problems arise from the level of an individual’s consciousness, and social, political and economics problems arise from the level of collective consciousness. The level of individual consciousness is reflected in a person’s disposition, temperament, attitude, and behavior, and the level of collective consciousness is reflected in a group or society’s culture, conventions, and institutions. See Meher Baba, The New Humanity and The Travail of the New World Order. Maslow’s pyramid graph of the hierarchy of needs is upside down. The foundation is actually self-actualization, from which the other needs follow progressing from the subtle to the gross. As Maslow himself recognized, self-actualization is grounded in transcendence. I guess I am wrestling with priorities Peter; my human nature, – and more generally, to understand and respect human nature as I find it; to see beneath its surface. Human beings come in layers. It took billions and billions of years to evolve a human being, so one of the things we should do is respect each other for who we actually are! And what we are a part of; the beautiful planet that is our home. We came from dust, the same atoms that comprise the universe; and atoms resolve themselves into energy that is Infinite. We should get to know our essence! We should get to know our Nature that is a home to that essence – and break down the mass media or political mischaracterisation, puppetry presentation of a human being that so horribly binds! We are a being with far more dignity and worth than the unconscious machinations the social systems imagine, even in their wildest dreams. Everything is all about being, though our attention is elsewhere. The world is actually a much simpler place than everybody makes out. So, I think on the outside, Govt. expenditure should be about purpose, compassion, and knowledge – to benefit people. If Govt. priority is human dignity, peace and prosperity so far so good – it may or may not set the stage conducive to the inner evolution of a human being – everybody might get so comfortable they fall asleep! I try to put my finger on what is the essence of the distraction from the inner priority, resulting in the perennial chase on the outside that ends in death and endures much suffering – and I feel the pulse of the ‘I’; the “‘dance of the I’s”. I’ll try a silly analogy: suppose there is a giraffe, getting nicely along the path of his evolution. He knows exactly what he has to do, everyday, to be a giraffe. Then one day he decides to become a giraffe ‘lawyer’, to settle differences between fellow giraffes over grazing rights and the Acacia trees. He becomes so busy being a lawyer, he forgets how to be a giraffe. It was very noble of him to become a lawyer and help; but if he loses himself in the process, then he will end up one highly confused giraffe. (I bet you thought you were an underpaid economist 🙂 )! We are not ‘money and machines’! We are human beings and we should know ourselves. Then work out what kind of society we need to express the beauty of our being. Relax a bit, enjoy existing. After very deep thought Dear Watson, I cannot conceive of anything more profound, than to enjoy existing!! Could we have a budget for that?